Toss 450g raspberries in a bowl with 50g caster sugar and leave for 1 hour. Blitz in a food processor, then push the purée through a sieve and discard the pips. Mix the purée with the finely grated zest and juice of 3 unwaxed lemons and 1 litre chilled soda water. Taste and add extra sugar, if required. 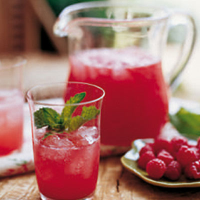 Serve in chilled glasses over ice and decorate with mint leaves.